MANILA, Philippines (Mindanao Examiner / Mar. 22, 2011) - The House of Representatives approved early Tuesday the impeachment complaints against Ombudsman Merceditas Gutierrez. With a total 210 affirmative votes, 47 negative, and four abstained, the House of Representatives on Monday night approved House Resolution 1089 containing the impeachment complaints. Ilocos Norte Rep. Rodolfo Farinas, House justice committee vice chairman, said the huge number of lawmakers who voted to approve the impeachment case is a clear signal of the Lower Chamber’s support of the case. "Magandang signal ito para sa Senado na buo ang mga kinatawan. It sends a clear signal on the impeachment action of the House," the Philippine News Agency quoted Farinas as saying. Farinas said with the approval of House Bill 1089, the Ombudsman will now have a chance to defend herself at the Senate. "Siya na rin po mismo ang nagsabi sa atin na handa siyang humarap sa Senado. Kaya let’s bring it on," he said. Agham party-list Rep. Angelo Palmones said what the House did could be interpreted as "a demonstration of People Power in Congress." "The members knew their mandate; they knew they had to exercise the power the people gave them in the last polls. What the House did was a reaffirmation of the people's anti-corruption message, which was explicitly expressed in the last polls," he said. "Merci (Gutierrez) and her ilk could saw what they want, but the message is clear. The people wished the removal of the corrupt," he added. House committee on justice chair and Iloilo Rep. Niel Tupas Jr., in his sponsorship speech on House Resolution 1089, said the panel followed due process in deliberating the impeachment complaints against the Ombudsman. "This is the product of complete impeachment proceedings. Despite initial setbacks and difficulties experienced by the House committee, no shortcuts were taken and every procedure was observed," he said. Tupas said the committee has determined the sufficiency of form and substance, sufficient grounds and probable cause of the Ombudsman’s case, as stated in the House rules of impeachment. 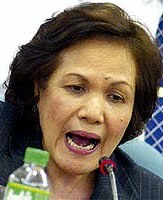 Gutierrez is being accused of betrayal of public trust for the supposedly low conviction rates of the Office of the Ombudsman under her term, and for her alleged inaction in five high-profile cases. The Lower Chamber will now transmit the impeachment complaint to the Senate for proper trial.